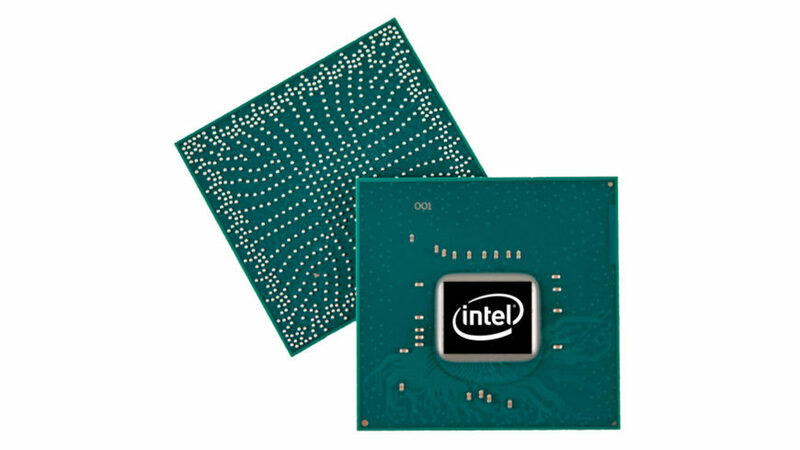 Intel’s Haswell-E processors have a launch literally around the corner (September 2014, according to some reports on the internet) and things are shaping up to what is expected to be a big launch for the enthusiast market – it’ll be the first major change for Intel’s HEDT platform in three years following the launch of Sandy Bridge-E and the first real chance for anyone still running a Core i7-930 or higher to really see a big jump in performance. Haswell-E dies are humongous, however. 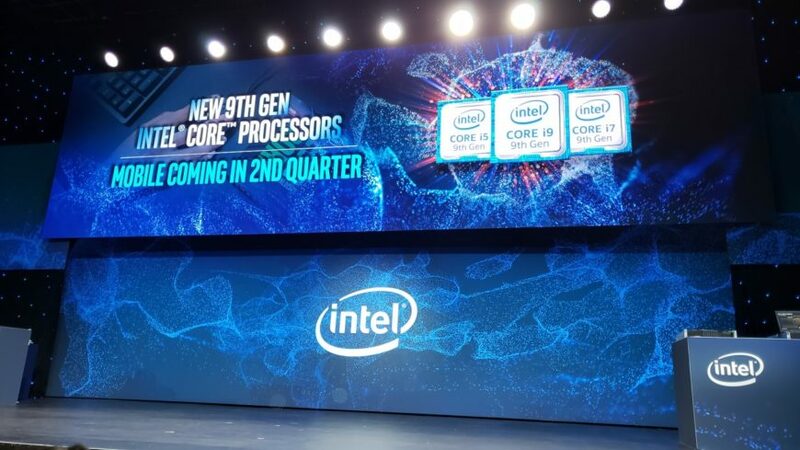 I fully expect that it’ll have a lot of cooling challenges to deal with and even Intel had to plan better for the extra heat these chips will produce. Their updated stock cooler for the LGA2011-3 socket gives us some idea of what we can reasonably expect from the new processors. Firstly, the cooler’s height has increased by about 10mm and from the side the fins seem to be spaced further apart for better airflow. 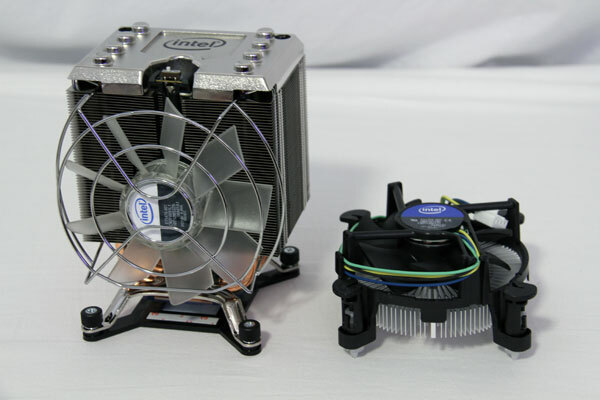 The fan is still the same unit lifted from the RTS2011 and it was also first used on the LGA1366 platform as well. It is clear plastic because there are some nifty blue LEDs embedded into the arm mounts. The mounting system is still a threaded screw with a spring to prevent overtensioning. 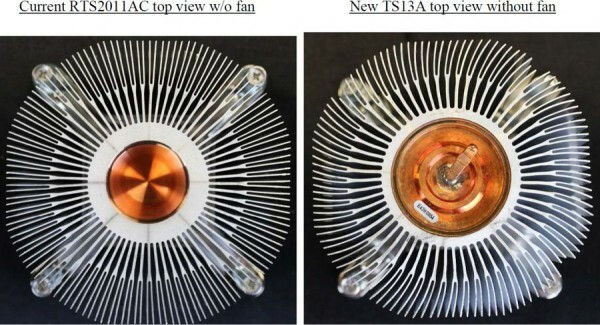 The top of the heatsink changes as well. The copper core is much bigger this time around and appears to have an extra cone running in the middle to improve heat transfer. It’s probably a vapour-filled chamber, however, since the main problem with applying aftermarket thermal paste on these circular coolers is that most of the paste settles in the middle of the heatspreader. We can also see the changes in fin direction more clearly, mostly to aid in airflow over the components around the CPU socket. Not only are the fins thicker at the base, it also appears that there’s less of them. That larger copper core extends all the way down to the base. You can clearly see the vapour chamber because the copper is a different density to the outer core and it also appears to be semi-lapped from the factory. It looks like Intel also made a slight change to the mounting arms, as these raise the cooler a little higher off the board’s surface. It’s possible that these will be incompatible with the older Sandy and Ivy Bridge-E platform because there’ll be a gap between the CPU and the heatsink base. 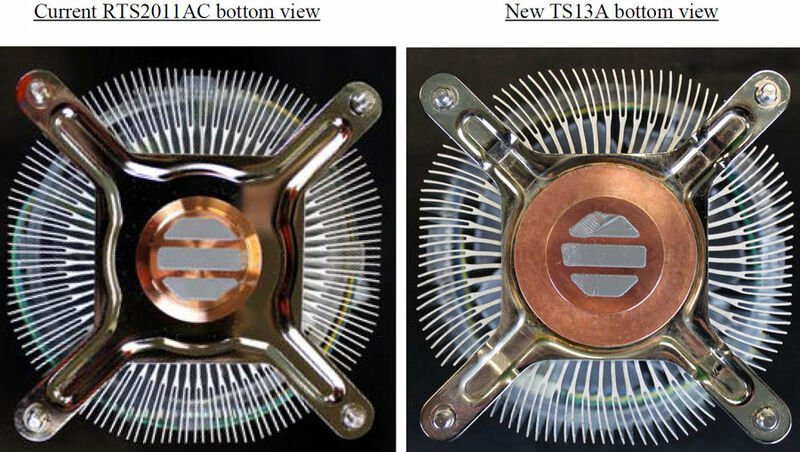 From the beefed up cooler design, I’d say that expecting Haswell-E to settle on the same 130W TDP as Ivy Bridge-E is pretty unrealistic at best. We’re looking at something far more suited to cooling a 150W or higher processor and along with that comes higher power draw and increased heat. Intel may have done their homework to ensure that their own cooler won’t bring owners any problems, but it looks like recommending Cooler Master’s Hyper 212 family for most rigs isn’t going to fly here. I will admit, though… I really miss the spectacle that the Gulftown cooler created. That was the first and only Intel air cooler that looked certifiably badass.